The times they are a-changin, and with them are people’s modern attitudes towards old things. As many things come under scrutiny for what they did decades ago – some rightfully, some questionably – TV shows made years ago have also fallen victim to today’s standards being imposed on them. Just as some millennials are offended by Friends nowadays, a pattern seems to be appearing with new viewers watching older TV shows. Though The Inbetweeners is barely a decade old, one of its stars believes it wouldn’t get made today, as the audience’s reaction would be very different to when it first aired. 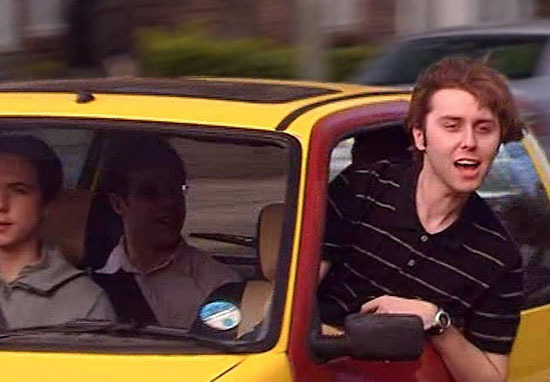 James Buckley, who played the foul-mouthed Jay on the show, told Digital Spy he thought that fear of causing offence nowadays is ‘killing comedy’. I think that when The Inbetweeners was around, everyone understood the context – that they were kids. There used to be a sympathy, where you could almost forgive them, because you can’t really have a go at someone for being stupid – that’s not really their fault. Nowadays, it feels very black and white with comedy. There’s no in-between, it’s just, ‘This person said this on television – isn’t that terrible?’ and it’s killing comedy, because you’re not allowed to joke about anything, it seems. There seems to be a joke police, nowadays. The Inbetweeners ran for 18 episodes over three series, and spawned two highly successful films. It followed four hormonal teenage boys, played by Buckley, Simon Bird, Joe Thomas and Blake Harrison, as they struggled with girls, school, parents and each other. It seems to be cool at the moment to be offended by stuff, and that’s a shame. It seems to be in vogue at the moment, and I’m hoping it will pass, because I do think that possibly people would maybe be more offended by The Inbetweeners if it was to be made today. Which is really weird, because it’s only 10 years. It’s only four years since we finished. Having said that, James enjoyed his time playing Jay, who became a firm fan favourite thanks to his outrageous, made-up stories, interesting use of language and general ridiculous behaviour. I like playing characters like Jay. It’s a way I wouldn’t want to behave, but it’s sort of freeing in a way. There’s an abandonment where you can play an obnoxious little sh*t bag, and have people say, ‘We really like you because you did that’. I guess the extreme would be if you were allowed to murder someone, and for there to be no consequences – like that movie, The Purge. Jay was my Purge for a while. Because anyone that does meet me will see that I’m a little, twitchy, nervous wreck shuffling his way through life, and too scared to talk to people. So it was nice to pretend to be that [other] person for a while. While the many people who carry briefcases, or catch buses, might not be particularly fond of The Inbetweeners, the show was certainly successful in summing up many teenage frustrations.